China's Ashun Wu had led the KLM Open after rounds one and two but he stuttered on Saturday, going from three clear to one behind Chris Wood with a round to go, and he trailed the Englishman for much of Sunday too. Wood, who had begun the week as a [32.0] chance, went a couple of strokes clear after the turn when he birdied both 10 and 11 and he was matched at just [1.15] but those that had taken the plunge at such a short price was very soon sweating when he immediately double-bogeyed the 12th. To his credit, he bounced straight back with a birdie at the 13th but that was his last deviation from par. Ahead of Wood, Wu was finishing strongly with birdies at 14 and 15 and after a quite brilliant up-and-down for par on 17 when tied for the lead he hit this stunning approach to the par five 18th. The eagle putt didn't drop but he tapped in for the birdie four and it was over to Wood. The Bristolian also found the 18th green in two but he hit his first putt too hard and his second too soft and the title when the way of Wu. This was 33-year-old Wu's third European Tour title and he'd began the week as a [140.0] chance generally, having been matched at a high of [200.0]. The best of my pre-event picks was [70.0] chance, Padraig Harrington, who finished fifth. The Irishman got to within two of the lead when he birdied the seventh and he was matched at a low of [6.4] but that was as close as he got to victory and he didn't trade short enough for me to lay anything back. In-play pick, Richard McEvoy, gave himself a chance with a great third round but he fell to a tie for 15th with a two-over-par 73 in round four but I got out of jail with Wu, who I backed at halfway at [4.3]. As highlighted in Saturday morning's post on the In-Play Blog, I thought Wu was a value price at halfway with a three-stroke lead but I can't pretend to have been too confident after Saturday's level-par 71. 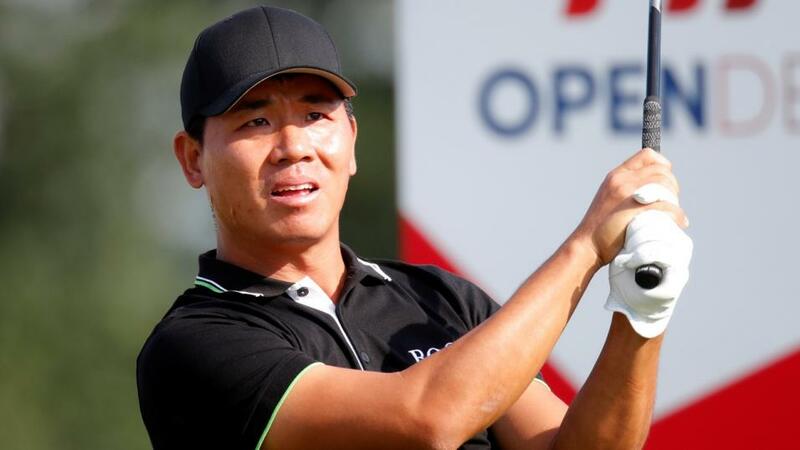 Wu looked to be going nowhere on Saturday afternoon, on a day when plenty of players were going super low, but he battled back with a couple of birdies late on to remain in touch, regrouped overnight, and won in style. Wu drifted from 3/1 to 7/1 between rounds two and three and he was matched in-running on Saturday at much bigger so with the benefit of highlight I should have pressed my bet because halfway leaders bouncing back on Sunday after a poor third round is far from a new phenomenon. Admittedly, the majority of players to fall out of the lead in round three continue to plummet in round four and Wu didn't look a massive price on Sunday morning but it's definitely something to keep an eye on. This was just the third renewal at The Dutch so trying to gauge what's required to win here was tricky before the off. After the first renewal it looked like Greens in Regulation was the key stat and after two renewals excellent putting looked more likely to be the key to success and this result vindicates that theory but only just. Wu ranked only 52nd for GIR but he ranked number one for Putts Per Round, averaging just 26, and the first four home ranked third, fourth, 10th and 14th for Putts Per GIR but I'd consider GIR a pretty key stat still given six of the eight players behind Wu ranked inside the top-eight for GIR. My man Harrington ranked number one for GIR but he averaged 31.3 putts to Wu's 26 so when it came to the crunch, putting was the most important factor this year. Away from the statistical angles in, from a course correlation perspective, it couldn't be clearer. McEvoy, who contended here, has a great record at the Diamond Country Club in Austria, which hosts what's now called the Shot Clock Masters (formerly the Lyoness Open and before that the Austrian Open) and the two men that fought out the title here, Wu and Wood, won at the Diamond Course in 2016 and 2015. And just for good measure, the 2016 winner at The Dutch, Joost Luiten, also won at the Diamond Country Club in 2013. After a quiet week, I'm really looking forward to this one. The Portugal Masters on the European Tour is one of my favourites and the FedEx Cup concludes at East lake with the Tour Championship. I'll be back later today or tomorrow with my previews.